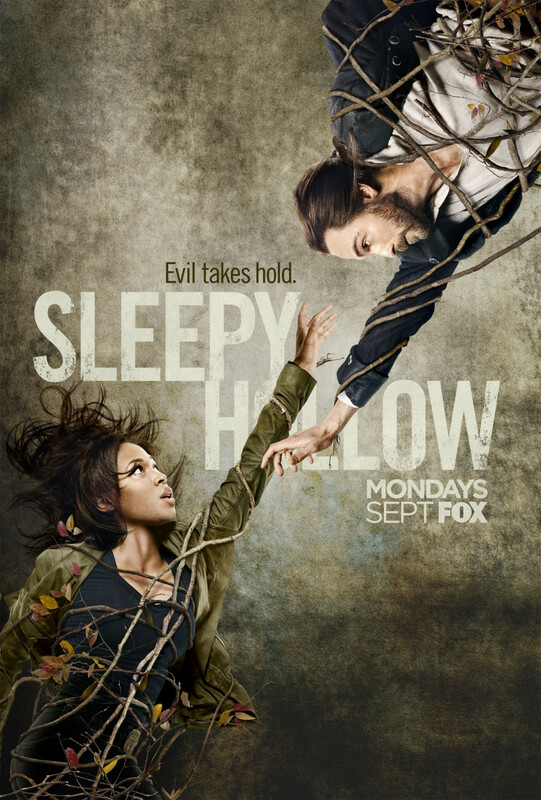 The Horror Honeys: Sleepy Hollow ~ Season 2, Episode 5 ~ "The Weeping Lady"
Sleepy Hollow ~ Season 2, Episode 5 ~ "The Weeping Lady"
Keeping up the wonderful supernatural fighting chemistry from last week, Abbie and Ichabod find themselves faced with a real urban legend. The Weeping Lady is a woman scorned and she seems to be specifically focused on the ladies that Ichabod holds close to his heart. I loved seeing Ichabod get his, now signature, clothing. Miss Caroline is so impressed with his devotion to colonial re-enactment that she gives him freshly churned butter before trying to seduce him. Unfortunately, her advances are rebuffed for Ichabod is a married man. Poor thing: she is so flustered that she is not even interested in the selection of delicacies from the far east that Abbie has with her. While we're on the topic of misplaced emotions, Abraham is no dummy and he knows that Katrina is not being as faithful as he would hope. No, that witch definitely has something up her sleeve, but who will be the focus of her betrayal? I'm not totally buying her devotion to Ichabod, especially after the laundry list of things that she has kept from him. The Weeping Lady is a legend all the way back from colonial times and she just so happens to be in the library while Abbie and Ichabod are searching for information on her. While I understand Abbie's knee jerk reaction to danger is to grab her gun, it felt really silly to have her telling a ghost to put her hands up and turn slowly. And then she shot at her. The ghost. Abbie Mills fired her weapon at a ghost. However, when the Weeping Lady turned around and flashed those vicious green eyes, it was truly creepy and the visual of the black pool in the middle of the marble floor was gorgeous. It was also very cool how when Abbie reached the water's surface she was in the river, but when Ichabod reached in to save her, she was rescued back into the library. Oh hey, good thing that annoyingly handsome Hawley was in the library so he could perform CPR on Abbie and save her life. Guess they hadn't yet developed this technique in Ichabod's time. It was gut wrenching to see him become so visibly distraught over the thought of losing Abbie. Unsurprisingly, this revenge fueled spirit is a woman who loves Ichabod. (Ichabod Crane, breaking hearts through the centuries.) Surprisingly, it is that damn Katrina who caused Mary to be The Weeping Lady. As she runs at Katrina, she is taken out by one of Katrina's many spells and this is when Ichabod learns the truth: Katrina caused the accidental death of Mary and then wrote that letter to cover her tracks. So basically, Katrina has stolen Ichabod from this woman twice and she has yet another item to add to her list of things that she never told her husband. Sure, sure, Henry caused all of this Weeping Lady ruckus, but if Katrina hadn't caused her death in the first place, there would have been no vengeful spirit to resurrect. Unfortunately, it looks as thought Katrina is going to become quite an integral part of Sleepy Hollow seeing as how she is a hellfire shard and vessel; whatever that means. Moloch definitely has a purpose for Katrina, but will she go willingly or fight alongside Ichabod? Huge, huge kudos to the team that so beautifully allowed Mary to run right through Ichabod's body. It was just fantastic and really felt beautifully surreal. Sleepy Hollow is one of the more beautiful looking shows on television right now and every week they seem to bring a little something more to the table. "A missive composed by thumb cannot adequately convey emotion." Preach it, Ichabod, preach it!